Honey was first a horse boarded at JPF by April. 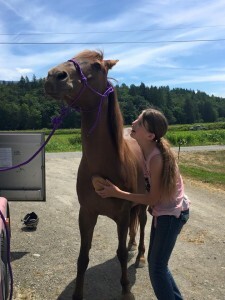 April bought another really cool Quarter Horse named Cash and wanted to find a new owner for Honey. I was putting some training on Honey for April when I realized she could make a lesson horse. She’s the right size and has a good mind. So the deal was made and Honey got to stay and become a part of JPF! Honey is loved by many students and does her job well with Beginners and Intermediate riders. 2016 Update: After many years of teaching, Honey has moved onto a semi-retirement home with the Noyes family. She taught both of their kids to ride and now Alexis and Mackenzie are taking care of her.